So when I heard some this afternoon, calling from some wetland over in the neighbour’s woods, I decided to grab my camera and go check it out. It was a gorgeous day and I was looking for an excuse not to go back inside; maybe, if I was lucky, I could spot one. I made the mistake of letting Raven tag along, however. She was already outside, and though it did cross my mind that she might be a little disruptive, I thought I could just have her sit-stay by the water while I poked around. I’d forgotten how much fun she has in water, and she hasn’t really seen much water since last fall. So when we got there, it was just too much. She tried her best, she really did; she sat-stayed for as long as her quivering muscles would let her. And then she couldn’t hold herself back any longer, and leapt into the water, tuning out all attempts by me to call her back (which, really, is rather ineffectual unless you’ve got one of those remote-controlled collars on them that’ll vibrate when you press a button. Otherwise, what do they care if you yell?). So the frogs didn’t happen. I could hear them, but I had trouble getting close enough to any to even have a chance of seeing one, since inevitably Raven would bound through just as I thought I might be getting closeish to one. But I found something just as good, or even better. I didn’t notice it at first, until it left the tree it had been hanging on on one of Raven’s drive-bys. It was a bat. It swooped down toward the water’s surface, skimming along and touching down once or twice, scooping insects from its surface (presumably; possibly it might have been drinking, although these shots suggest a different posture for that). 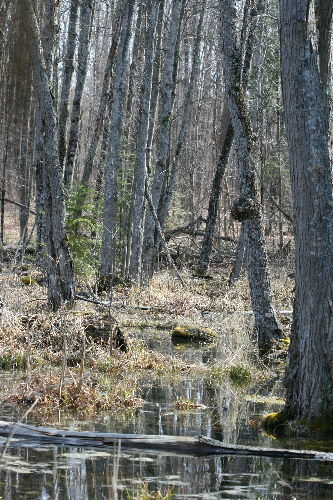 Then it would return to the tree trunk to eat, hanging upside-down. I was absolutely fascinated, and this made the entire trek worthwhile. I’m not sure how long I stood there, watching it, but probably fifteen or twenty minutes. It moved to the far side of the swamp for a little bit, and I watched it fly back and forth over the water over there, while a Hairy Woodpecker worked a tree and a couple of robins moved through the branches above. I was standing at the northeast side of the water, so as it swooped back and forth the sun would shine through its thin wing membrane, illuminating it and highlighting the bone structure. That’s not something you get to see too often! 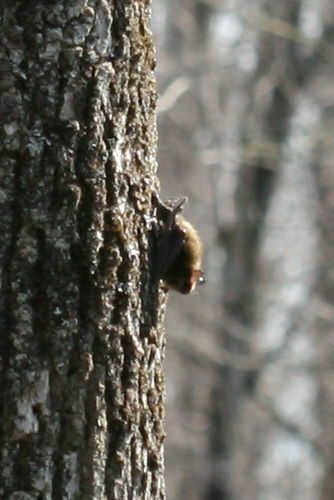 I was a little surprised to see a bat out in plain daylight, and in the sun, no less, not even the deep shade of the forest (or what might pass for deep shade in the leafless deciduous woods). Googling it, though, it seems this isn’t an altogether unusual occurrence. Most of our bats hibernate over the winter. In the spring, as the temperatures are just starting to rise, the nights can often still be quite cool or even freezing, even while the days are fairly warm. Early-risers may take advantage of these warmer daytime temperatures to do some foraging, choosing to sleep at night instead, at least until the nights start to warm up, too. Not only are there a lot more insects out flying during the day (if the temperature’s really cold, there might not be any insects at all at night), but it’s a lot easier on the bat, too. Once the nights are warm enough they’ll return to their nocturnal habits. I couldn’t tell you what species it was. According to the Atlas of the Mammals of Ontario, there are 8 species of bat in the province. I know Red Bat (Lasiurus borealis), Silver-haired Bat (Lasionycteris noctivagans) and Hoary Bat (Lasiurus cinereus), but the rest of Ontario’s bats all sort of blend in together – especially when you’re seeing them from a slight distance, while they’re on the wing. The remaining possibilities are Eastern Small-footed Bat (Myotis leibii), Little Brown Bat (Myotis lucifuga), Northern Long-eared Bat (aka Northern Myotis; Myotis septentrionalis), Eastern Pipistrelle (Pipistrellus subflavus), and Big Brown Bat (Eptesicus fuscus). From what I can tell, ID between these species depends primarily on structural details of the ears and head that can’t be seen in flight or from a distance (unless you have a really good camera). For Little Brown, it comments: “Forests and rural areas, usually near streams and lakes” and “Emerges at dusk or later, usually flying to water to forage and drink. … Feeds mainly on emerging aquatic insects”. For Eastern Pipistrelle: “Woodland or mixed farmland” and “Feeds on tiny flies and beetles, hunting over water or at forest edge”. It’s the note about Little Brown feeding on emerging aquatic insects that causes me to lean toward that species as the most likely candidate, although Big Brown seems like a pretty good possibility as well. Being completely subjective about it, the shape and relative size of the head in the first photo, where it’s hanging on the tree, seem a better match for the Little Brown in my guide. But it’s probably one of those things that has to be left without a definitive ID. Pretty cool, regardless! Even if the images are not the best this is really cool. Never seen a bat fly during the day before. What a great find! 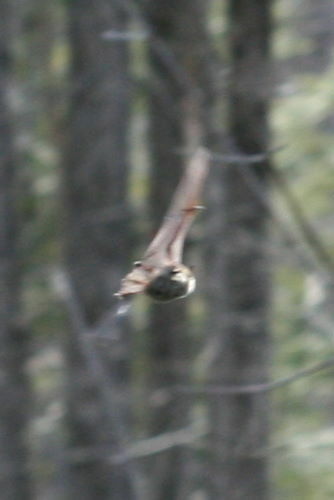 I’ve never seen daytime flying bats but I will be watching more closely now. That is unreal. Blows my mind really. Of course the explanation makes sense, but it just goes to show how ingrained our perceptions are of bats. It also helps answer a question I had a long time ago. When I lived in Fort Providence we had light that approached 24 hour light during the summer. The Sun set each day, but around the equinox it would only get twilighty. I knew that there were bats there, it must have been close to their northern limit, but I did find one on the hood of my truck one morning. Which got me thinking, how they’d catch enough food in the limited night. Of course one thing that there was no shortage of in Fort Providence was flying insects, so I just assumed that they had so much insect wealth they didn’t need much time to forage. Tres cool! What a serendipitous discovery. I’d say look for a white snout if you were in NY, where white-nose-syndrome has essentially wiped out the brown bats. Here in MI, though, I am eager to see my fluttery friends once more – the disease doesn’t seem to be here yet. Thanks for sharing such great pics! How very cool to see this..FUN! Amazing, Seabrooke! Love those shots! Wonderful shots, another great find. Thanks for this great post and pictures. 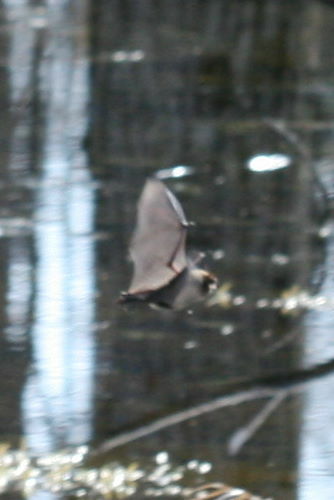 I saw a bat skimming our pond for the last two days. Did a search and found your post. Appreciate the information and confirmation that I am not seeing things! very odd. I recently had a customer of mine tell me that she has bats ( little browns ) , and the are flying around her deck/pool area during the daytime hours of 11:30 a.m – the evening hrs. Upon my inspection, I found 3 of them roosting on the siding under the overhang at 2:oo p.m ! Why are the active this early in the day ? 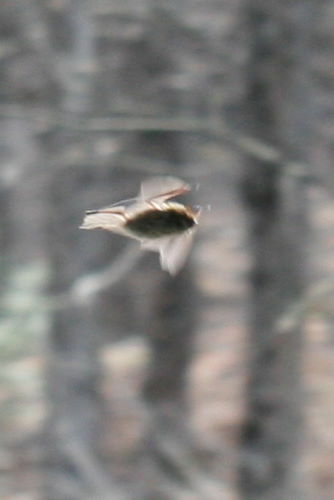 Great article thanks so much I just seen one the last two days in my backyard we have a large pond and I was kind of freaked out being it was Sunny day light and this brown bat kept flying around I was concerned so I thought I would Google it and found your article thanks you put my mind at ease! Glad to find your article. 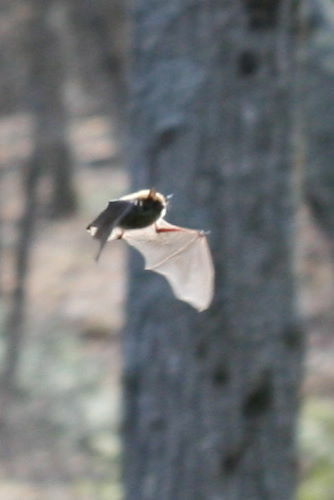 Just saw a bat flying around the Devil’s Kitchen area near Warner Valley in Lassen Volcanic National Park in California around 1:00 PM yesterday. It was flying near a bridge and later a ranger said it was probably roosting under the bridge and got disturbed. It looked healthy. I think it is a mistake that people often make to assume that a nocturnal animal that is out during the day is sick. Of course, that is a possibility, but not a given. It was very cool to witness this unusual occurrence, whatever the cause. I found a bat on the back of a church – albeit resting during the day. I looked this up and found out that during migration bats will find less typical places to roost until they reach their destination. So amazing to spot and I love your photos – so much fun to witness it flying around I’d Imagine! Just witnessed same phenomena. 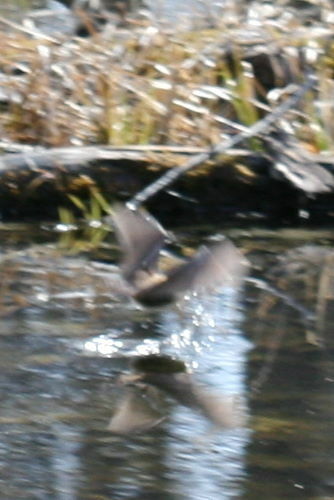 A daytime bat skimming the water on north shore of Madeline Island in Wisconsin (south shore of Lake Superior). Temperature around 50F today, but nights near freezing. Lots of insects out during the day.